The Vince Lombardi trophy. The Philadelphia Eagles beat the New England Patriots 41-33 in Super Bowl LII at U.S. Bank Stadium on February 4, 2018. Photo by Kevin C. Cox/Getty Images. 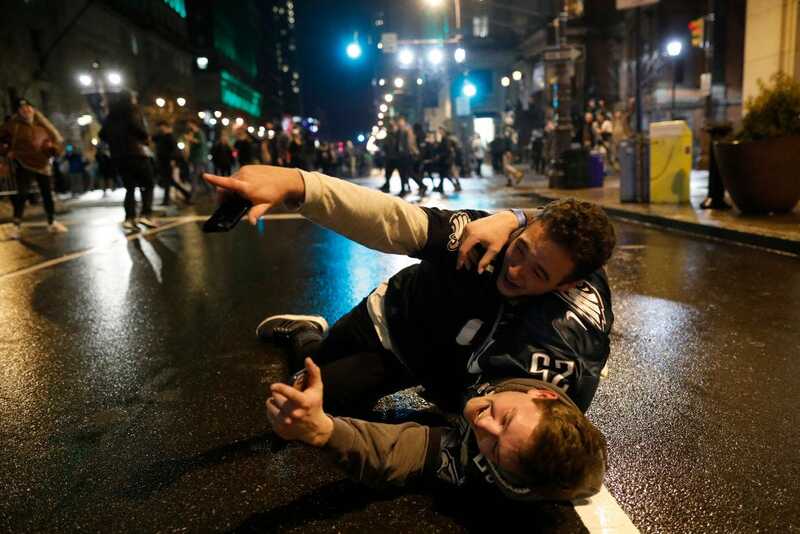 After the Philadelphia Eagles won Super Bowl LII, fans took to the streets to celebrate the team’s first-ever victory in franchise history. On Sunday night and early Monday morning, crowds flipped over a car, set another vehicle on fire, took down and climbed light poles, smashed windows, scaled City Hall with a keg, and littered streets with beer cans and other debris. The Philadelphia Inquirer also reports that between “Everything is free” chants, several fans looted a gas station. Philadelphia has now started cleaning up. Photos on social media show some of the morning-after mess. Trucks are sweeping the streets. Traffic signs are now lying on their sides. Next to City Hall, crews shoveled glass after fans broke a Macy’s window. Rowdy post-Super Bowl celebrations aren’t unusual. Over the years, there have been reports of fans igniting cars, partying in the streets, smashing windows, overturning cars, and in some cases, causing hundreds of dollars-worth of damage in both winning and losing cities around the United States. Getty ImagesFans celebrate in Center City after the Philadelphia Eagles defeated the New England Patriots to win the Super Bowl on February 4, 2018 in Philadelphia, Pennsylvania.